Photographs of a three-year-old Kurdish migrant child washed up from the beach in Turkey symbolized the worsening humanitarian and political crisis unfolding in Europe. 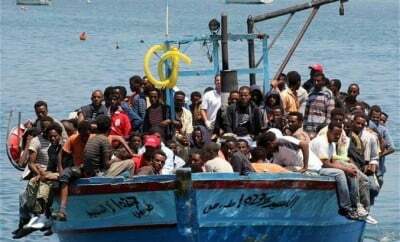 Since the beginning of 2015, thousands of people from various geo-political regions in the East have died in the Mediterranean. Many of the people who pay human traffickers to navigate a “safe passage” to Southern and Eastern Europe are fleeing from United States imperialist coordinated wars of regime-change. Others have been dislocated by the ever-growing world economic crisis of capitalism, where despite the claims of a full recovery from the Great Recession of the last decade, people are sinking deeper into poverty and instability. A near rebellion in Hungary among migrants, many of whom are from war-torn Syria, forced Germany and Austria to allow the exit of thousands of people by train. When the first group of migrants reached Germany they were met with welcoming crowds after conservative Chancellor Angela Merkel announced that the country would grant sanctuary to many of those fleeing the Middle East, Africa and Asia over the next few years. Nonetheless, European states are divided over how to deal with the growing problem. Faced with its own economic and political problems, compounded by widespread anti-immigrant sentiments based on racism, various states on the continent are concerned over a large influx of people from formally colonized states. Hungarian right-wing leader described the crisis as a problem for Germany and not his county which wants nothing to do with migrants. The approach of Budapest was to view the people looking for sanctuary as criminals to be detained and sent someplace else. Contrasting this attitude at least for now is the leadership in Germany which announced that they are willing to take up to 800,000 people and perhaps more. The conservative coalition ruling the country has appealed to other European states to follow their example. European responses to the policies put forward by Merkel which were scheduled for release on September 9, could seriously strain relations among the continental states. One of the stated objectives of the migrant plan is to establish intake centers in several nations including Italy, Greece and Hungary. Hungary at the aegis of its government had held up thousands at a train station seeking to move on to Austria and Germany. Many of those detained were set to be relocated to a detention camp. Scenes of unrest that flared in clashes between the Hungarian police and the migrants, portends much for what is to come in the next several months and years. Since there are no plans by the imperialist states to curtail their militarism in Africa, the Middle East and Asia, along with the economic uncertainty which grips the entire world, Europe will not be able to escape the contradictions that have developed through its alliance with Washington and Wall Street. Western and Northern Europe are already impacted by the fallout of the interference in the internal affairs of the oppressed nations. Rebellions led by residents and citizens whose origins are within the developing states of Africa, Asia and the Middle East have taken place over the last three decades. Just in the last decade unrest has hit France, England and Sweden. In most cases the rebellions were sparked by acts of police brutality and killings. However, the underlying causes stem from the broader socio-economic disparities between people of color and Europeans and the failure to address the question of national oppression within the continent itself. It is inevitable that discontent will set in soon among the migrants. The type of employment, housing and educational opportunities available for immigrants and their descendants from the developing countries are wholly inadequate. Unemployment remains high among African, Asian and Middle Eastern residents in Europe even for those who have become naturalized citizens or second and successive generations of inhabitants. Even though many people coming from Syria, Iraq, Yemen, Libya, Nigeria, Somalia, Eritrea, Afghanistan, Pakistan, etc. may feel relieved initially to settle in Germany and other European countries, the harsh realities of racism and economic hard ships of living outside their areas will soon come into focus. Germany could very well have a role for the migrants in some military or political fashion. After World War I and II, the once powerful imperialist state which fought for dominance over the peoples of the world against the U.S., France and Britain, was destroyed with the defeat of the Third Reich by the Soviet Red Army, the largely communist-led resistance in France, Yugoslavia and Greece along with the might of the British and American forces. The U.S. military strategy under the administration of President Barack Obama is designed to share the “white man’s burden” of the 21st century. Although Washington and Wall Street will take the lead in regard to intelligence gathering, destabilization operations, targeted assassinations and air power, the deployment of troops in ground operations result in casualties which could prove costly in political terms inside the country. There may very well be ample room for Germany and other European states to engage in broader and more long term interventions that are designed to “stabilize” those regions which have been deliberately destabilized by the Pentagon, the Central Intelligence Agency (CIA) and the North Atlantic Treaty Organization (NATO), and therefore migrants from the most hotly-contested geo-political regions could serve as a bulwark in the implementation of neo-colonial control over states which have been targeted for regime-change. This crisis of mass migration, repression and resettlement also serves to reinforce the oppressive conditions under which Africans, Middle Easterners and Asians live under in the imperialist states, particularly the U.S. As the Obama administration and the corporate media pretends as if it has nothing to do with the destruction of nation-states and societies throughout the world, by implication of a denial of responsibility, the focus is shifted to the oppressed nations apportioning blame on what are described as repressive governments in various countries. Yet even with these distortions of the true set of circumstances that have prompted the exodus from the East, the actual conditions within the Western states are by no means conducive to the integration of Africans, Middle Easterners and Asians within the European and white American dominated societies. In the U.S., African Americans and Latinos have engaged in mass demonstrations and urban rebellions in response to racism and economic exploitation. This level of unrest will not only continue but become even more pronounced. Consequently, it is important for representatives of the oppressed within the imperialist states as well as the working class in general, to not only welcome these newly arriving migrants but to defend them against the repressive structures that are entrenched in the industrialized countries. Moreover, the capitalist states of the West have very little to offer the migrants and therefore they must take up a position as the natural allies of the forces that are fighting to overturn racism and socio-economic injustices.